Total fishing effort in the north Pacific from January 2017 to January 2018. The region within the white outline is the North Pacific Fisheries Commission management area. Earlier this month, Global Fishing Watch attended a meeting of the North Pacific Fisheries Commission (NPFC), a relatively new Regional Fisheries Management Organization (RFMO) charged with managing the high seas in the northern Pacific. The NFPC has set an ambitious objective of ensuring ‘the long-term conservation and sustainable use of the fisheries resources in the Convention Area while protecting the marine ecosystems of the North Pacific Ocean in which these resources occur.’ Understanding the behaviors of the fleets within the Convention area represents a critical first step towards achieving these goals and managing for transparency, traceability, and sustainability within NPFC fisheries. Working with our research partners from the Australian National Centre for Ocean Resources and Security (ANCORS), we presented a preliminary report providing insights into the spatial and temporal patterns of the fishing activities within the NPFC, especially focused on fleets that use powerful lights to attract the fish, such as those targeting Pacific saury, neon flying squid, and chub mackerel. We also provided several case-studies illustrating the potential for Global Fishing Watch data to support NPFC’s mission and long-term objectives. NPFC, though the northwest is dominated by vessels using powerful lights to fish, especially later in the year, July – November, when squid and small pelagic fish are abundant. 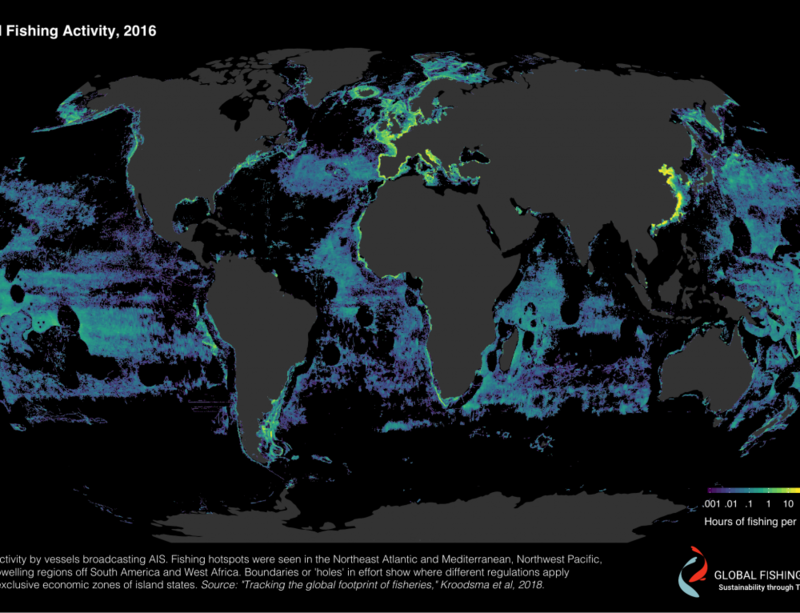 fact fishing using light, and corroboration of the fleet size, was also presented using night light vessel detections from VIIRS satellites (this new data layer is now also available on the Global Fishing Watch public map). Below is a map of data from VIIRS, showing where these vessels were fishing at night with bright lights. In addition to this region of the NPFC, vessels that use light to fish are also common in the waters off Peru, Argentina, and several other regions of the ocean managed by different regional fisheries management organizations. We have found that vessels that fish in NPFC may fish in these other regions at other times of year. Such findings demonstrate that enforcement and monitoring of IUU fishing and other activities will require close communication between all RFMOs in which these vessels operate. 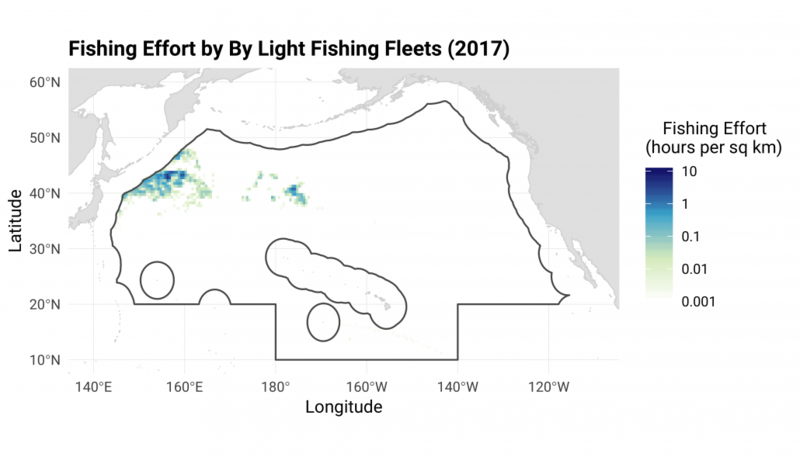 Fishing effort restricted just to vessels fishing using powerful lights in the north Pacific from January 2017 to January 2018. The region within the white outline is the North Pacific Fisheries Commission management area. 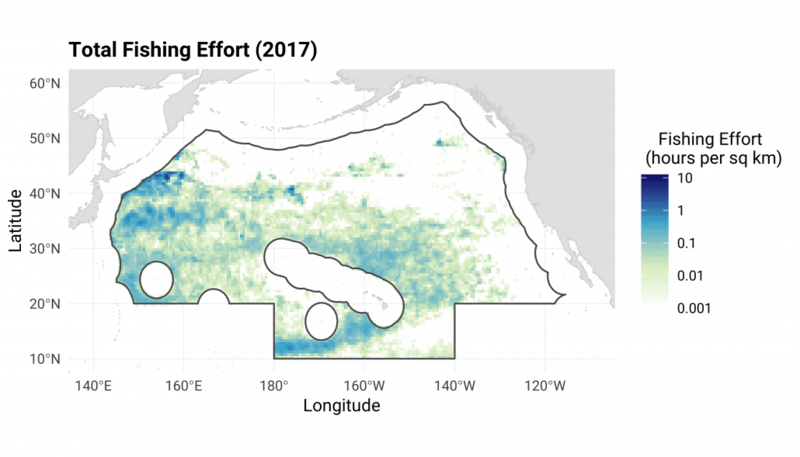 The fishing effort within the NPFC is primarily concentrated along the northwestern portion of the commission from July to November (peak season for vessels targeting neon flying squid and Pacific saury). The report was well received at a side event during the annual NFPC Commission meeting, generated valuable discussions with delegates from member countries, and we look forward to continued conversations in the coming months. There are clear opportunities for vessel tracking data, such as AIS, to improve our understanding of the fisheries in this region and contribute to the monitoring and enforcement activities the convention is implementing. Over the next year we will continue to study this region and hope to present a full report on our findings in time for the next year’s NPFC Commission meeting. 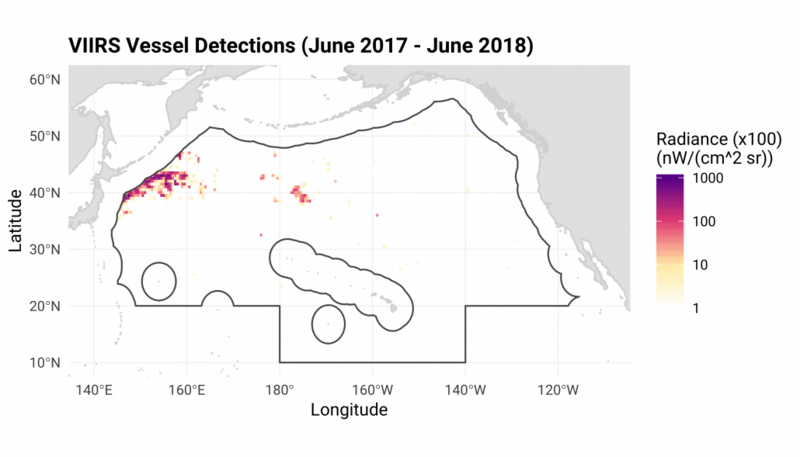 Figure 3: Night light vessel detections within the NPFC Convention area from June 2017 to June 2018, illustrating the presence of light fishing fleets in the northwest portion of the convention area.